Do you and your loved one love lighthouses? Have you ever dreamed of exchanging your vows in such a special place? Race Point is surrounded by miles of unspoiled beauty, providing you the perfect setting on such a wonderful day. 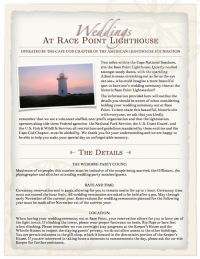 We encourage you to read our downloaded PDF document,"Weddings at Race Point Lighthouse", which includes all of the important details you will need to know before planning your wedding ceremony at the lighthouse. If you do choose to hold your wedding at Race Point, it will make for an unforgettable memory!